In the wake of the Swedish suicide bombing, British police tracing the attacker's history fear terror cells are very deeply-rooted. And it has brought the spotlight back on to Luton, a town becoming infamous for its links to extremism. ­Not only did the Stockholm terrorist live there, but it was also the starting point for the London tube bombers' final journey. Mosques, hijabs and halal meat shops. A scene straight from the bazaars of the orient, but this is a city north of London, home to some 25,000 Muslims of British and other origins that are increasingly on the edge. One of them was Taimur Abdulwahab al-Abdal, better known now as the Stockholm bomber. Abdul Kadir Bashk knew him, and describes a volatile character rejected by the community at large. “When he was here, he was challenged. His ideologies, his thinking were challenged, and when we realized he wasn’t changing, we exposed him to every member of this mosque, this community. 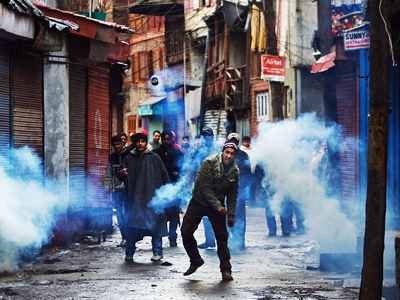 He got upset, angry, and he walked out, and we never saw him again,” said Abdul Kadir Bashk. The next they heard, al-Abdal had blown himself up in Sweden in December 2010. The Stockholm bomber’s family blames England for turning him from a normal boy into a fanatic. Some point to unemployment and social deprivation as the reasons for the extremes found in Luton. 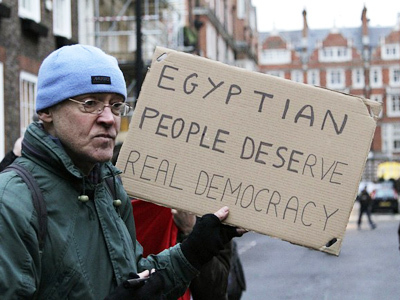 But Baskh lays the blame squarely at the doors of the government. “Before 9/11 we had never had these issues, so all this has developed since 9/11. The government’s foreign policy, that’s what’s sparked all this up, going into Iraq, an illegal war, killing women and children, going into Afghanistan, carpet-bombing indiscriminately,” explains Baskh. However, the Stockholm bomber’s trace is just the latest claim to infamy for Luton, which is fast becoming known as a hotbed. The English Defence League, committed to protecting England from what they see as a wave of Islamism, decided to step in. Leader Tommy Robinson believes he is walking where others fear to tread. “We have got a legitimate argument. We’ve got grave concerns in our community and we need somebody to voice those concerns – the politicians aren’t doing it, they’re not doing it. They daren’t say it,” claims Robinson. 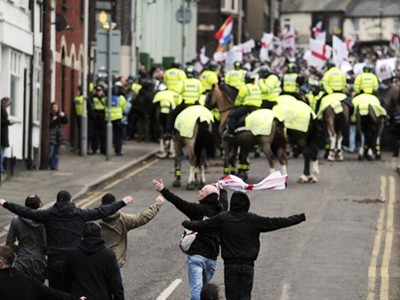 The EDL call Luton their home, although others say their roots are in football hooliganism. They recently held their biggest-ever march through the town, ahead of which Robinson says the police told him his life was in danger. “You have been advised that it may be appropriate if you leave the area for the foreseeable future,” said the note from the police. The town of Luton has undeniable links to Islamic extremism, and that, in turn, has led directly to the rise of groups like the EDL who feel the England they know is under threat. Meanwhile, the people of Luton see their town in the headlines because of extremists from both sides of the fence. The town’s MEP Richard Howitt says the vast majority of Lutonians live in harmony and are distressed by their home’s image. “What we can do is, in peace and harmony, to stand quietly and peacefully and show that the vast majority of this town and this country of all faiths do not believe, do not accept this organization, and we do not want them here,” said Howitt. Thus, wars led by the Western powers thousands of miles away make their presence felt in Luton where, every so often, shopkeepers board up the town center, and prepare for the hurricane of extremism to pass through.